Today got a msg while I was typing on watsapp chat box. (screenshot attached). 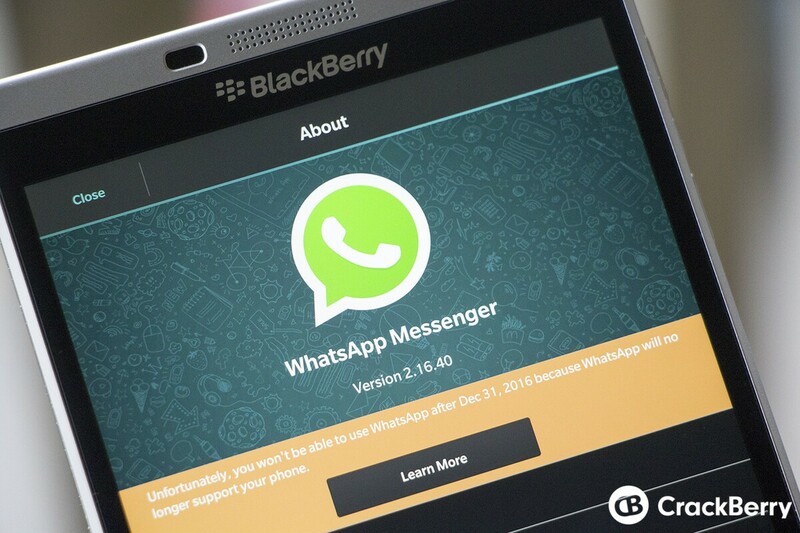 Its very much clear and confirmed, watsapp will NOT work even if its a old version. Already started looking for my alternatives. Bye bye q10, u were great companion. Sorry cant attach pics in so called blackberry browser on so called blackberry fan site. In short the msg says wats app will no longer work after dec 2016 so get a compatible phone and click on learn more for more details. Soon u guys will also start recieving it. I got it in india. cribble2k and berry_gamer like this. If you use the so called CB app for this so called BlackBerry fan site you can upload your so called screen shot with no problem. Watsapp, Facebook, Snapchat, Mysapce. All will not work on BlackBerry. The droid version of Viber on the Amazon App store still works for now..
You can have my BB1 0 phone when you pry it from my cold dead hands. I am using browser and crackberry website open in it, do I need a app to visit a primarily a website which hardly intrest most of BlackBerry users now? Lol! Some people just don't know how to use their so called smart phones. Now a pop up msg started to come too,maybe I didnt see the msg while installing the new version. End of road for many users from india, our things are connected with wats app with lawyers, doctors, teachers all connected here. Priv is a no show, cant pay 800 usd for pkb and plastic phone with average ui, whr hub is just nothing but trash. Does it make any sense to install a app of a website which hardly show or reveal any new things now? Maybe u installed it in so called smartphones but I dont think cb app deserve a place in my list of apps. I use browser for most of things I use in a month, same with cb. This one will really see all BlackBerry smartphone users in India changing to other options. Whatsapp is that popular in India and is undoubtedly a convenient tool for communication both personal and professional. I still fee BlackBerry should convince the associated stakeholders and get the support back.I am using a splendid BlackBerry device called passport but I really don't know how will I live without whatsapp and I will have to sell this and get an iphone. People still use Myspace lol? What on earth do the shareholders have to do with it? Is Zuckerberg on BlackBerry's board? Facebook decides who gets to use its software, not BlackBerry. EDIT: I read "stakeholders" as "shareholders." My mistake. That makes more sense. But if you read Whatsapp's official release from a few months ago, they made it clear that there aren't enough BlackBerry 10 users to be worth their time. Last edited by kvndoom; 07-01-16 at 05:58 AM. TgeekB and DrBoomBotz like this. This is the end for me, all my group chats are on whatsapp. I would use bbm but you know, you can't even send videos in a group chat LOL. It will have a big impact on people's decisions to move on. You cannot survive without an app like this. Unfortunately social apps are integrated into everyone's daily routines and folks are only going to buy devices that have the app ecosystem to support them properly. It's 2016 and not 2008 and that's just reality in today's marketplace. BigAl_BB9900 and TgeekB like this. I hope everyone understands it does not work that way. The BlackBerry 10 app is a client, that connects to servers. Those servers know which client apps are connecting to them, and have the ability to refuse connections on that basis. If you refuse to update, you'll just be denying yourself any bug fixes (and/or features) we decide to implement between now and the cut-off date. Well they can get to feck then! By the way it's 31 DEC 2016 Dec as in December no idea what disember or maybe it'll work forever since disember never comes. What if we bb10 users pay $1 for one year of service?